Adkins Arboretum is the only arboretum or public garden that focuses solely on plants native to the Mid-Atlantic coastal plain. Because of its location on the Delmarva Peninsula, at the junction of the piedmont and the coastal plain where northern and southern plant life overlap, it has diverse habitats that support more than 600 species of native shrubs, trees, wildflowers, grasses, and ferns. By walking the Arboretum grounds, visitors can experience native plants in a natural setting, as well as in ecological restoration projects and in cultivated gardens. The Arboretum is a model for land stewardship, playing an important role in protecting the health of the Chesapeake Bay by preserving and restoring the native flora of the region. Through its educational programs and science-based approach to land stewardship, the Arboretum promotes appreciation and conservation of native plants to more than 18,000 visitors annually. 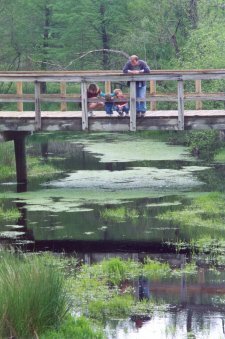 The Arboretum strives to reach a broad audience—children, families, nature lovers, gardeners, hikers, bikers, as well as professional land planners,natural resource managers and horticulturists—through guided walks, lectures, demonstrations, children's programs, plant sales, art exhibitions, and seasonal community events.